Me and My SoldierMan: Let’s Talk Opening Ceremonies! Who watched the Opening Ceremonies last night? Oh, come on, who didn’t watch them! I don’t normally post on Saturdays but I really want to talk about them – the good, the bad and the fugly - and I’m hoping you do, too. There are a TON of pics. I’m sorry I just killed your browser. 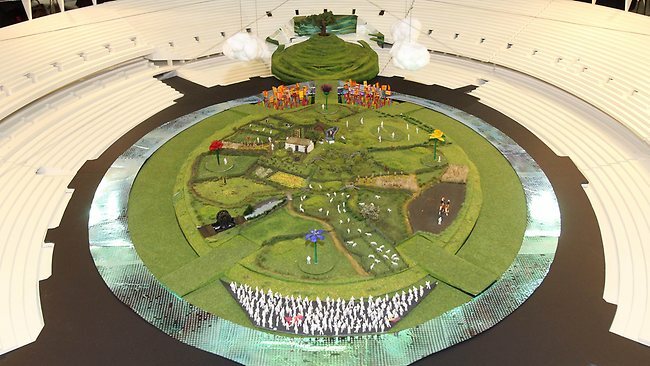 But you can’t talk about the Opening Ceremonies pageantry without pictures! Flippin’ annoying. I absolutely hated that they were there. 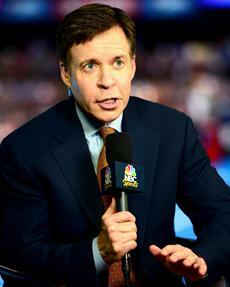 Mostly Costas, because he just wouldn’t shut up. And then Viera would “explain” things 5 seconds BEFORE they happened (after promising not to “spoil” anything). The whole time I’m listening trying to tune them out, I’m thinking, they must think we’re absolute morons, not even giving us the chance to try and work out some of the artistic symbolism on our own. Turns out, I was right. Remember that, folks. The MSM thinks you’re incapable of handling reality unless they sanitize it and spoon-feed it to you. And I swear that’s the closest I’m coming to politics. The different montages were really neat, too. The first where we travel through time from feudalism to the industrial age to the 20th century “carnival” – very well done. And I can’t lie, I teared up a little when they had the group of retired soldiers marching across the stage. That was really sweet. I think the next thing was the hospital portion? That was pretty trippy. It was a very strange mixture of celebrating British literature and…socialized medicine? 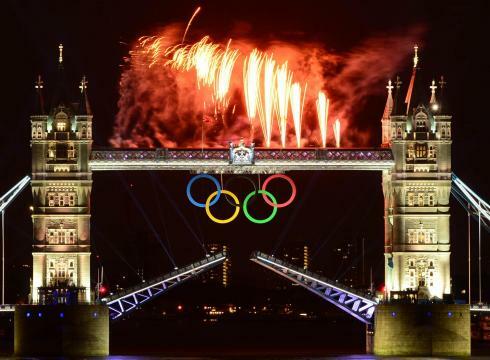 I mean, what country spells out a government agency’s name in lights at the Olympics Opening Ceremonies? Even Beijing didn’t do that. :/ That was odd. And the inflatable baby…. Yeah…NO idea what they were thinking with that. 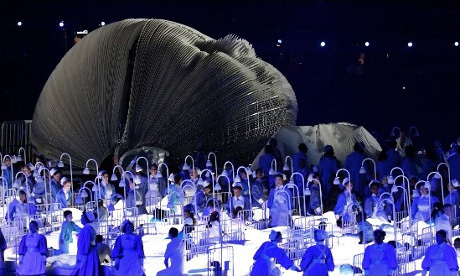 That may beat out Vancouver’s inflatable polar bear for cheesiest/worst “effect” at an Olympics Opening Ceremonies. But having the various villains from children’s literature pop up and then be vanquished by Mary Poppins – very cool. And again, the volunteer performers, all real doctors and nurses – awesome! I’m not sure who I was more excited to see, James Bond or the Queen. That was a cute little interlude. And I’m glad they gave her an “entrance.” I just wish the royal family had left their stiff upper lips at home yesterday. They all looked positively bored the entire time. Come on, guys! It’s the Olympics! And the “guest stars” – um, wow! That was a wonderful touch. I‘m not gonna lie, when I saw Branagh on the stage, I clenched. I thought, "Oh geez, are we in for a 40-minute monologue? Because he’s a fantastic actor but my goodness, can he make a movie under 2.5 hours? But of course, he was amazing. JK Rowling, obviously nervous as all-get-out (and who wouldn’t be?) was the perfect segue to the literature segment. 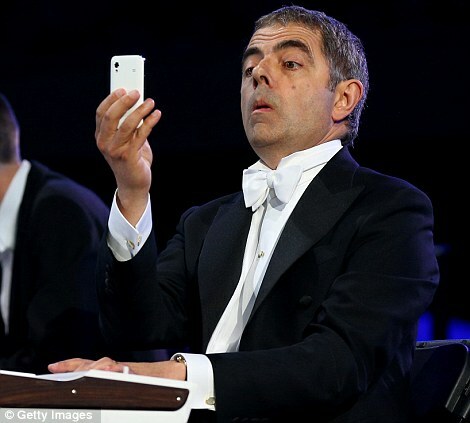 And Mr. Bean. Chariots of Fire. Fantastic. Fantastic. So, I probably missed some of your favorite parts, please feel free to put them in the comments. Now for the fashion show – er,I mean the Parade of Nations. Again, fantastically done, perfect choice of soundtrack – it’s a party! – and as always, super fun! I especially love it when the smaller African nations are going by. They have the best outfits and always look like they’re having so much fun! And my goodness, it was the year of the Judo athlete, wasn’t it? I think half the flagbearers were Judo athletes! I don’t understand the jackets. At all. And these guys – love ‘em. Just love ‘em. They were probably my favorite part of the Parade. Not for their clothing, but for their spirits. They were SO excited to be there and let the whole world know it! I hope they get second to us in everything. Feel the rhythm! Feel the rhyme! Usain Bolt! Screaming-excited lady in the background! Jamaica! Mexico was fun and colorful, as always. Okay, I admit, the outfits looked much better on the athletes than they did on the Ralph Lauren models. I still don’t like the scarves. And nothing says “lame” like a beret. Sorry. I think this was the most poignant torch-lighting ceremony I’ve ever seen. It really was so well thought out and beautiful. 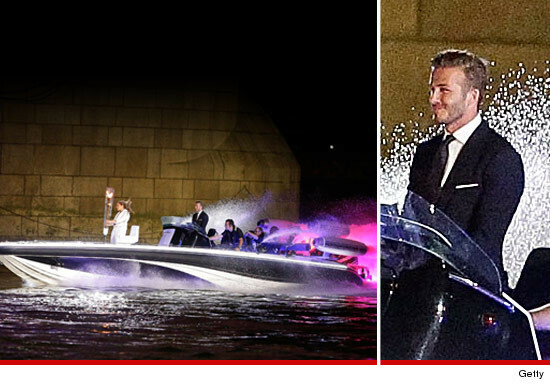 First of all, David Beckham. Yes, indeedy. What more perfect symbol could they have done? I love it. I just love it. And then there was Paul McCartney. Which was nice. His audio people were not on the ball. That’s all I’m saying. So, there you go. It was an awesome ceremony and very impressive. With the exception of Inflatable Baby, which almost brought them down to Vancouver standards, I have to say I thought London was at least as good as Beijing. At least. I was sad Colin Firth wasn't stuck in there somewhere. I think my favorite part was the children's choirs. I cried! That was SO sweet :} And I really enjoyed the opening video of the "journey" down the Thames. I loved Branagh, Rowling, Craig, Beckham, and, of course, Bean! The NHS part was completely unnecessary, I thought. I think the Children's Lit section could have stood alone. The music section was neat, the way the technology age was incorporated...but it felt a little rushed to me. They didn't hit on some of the artists as much as I thought they could have (cough, cough...The Beatles...cough), but, in all fairness, I guess there was a lot to get through. The music and the Parade was really fun :} But, Oh USA...berets? Really?! The torch ceremony was pretty much the best I've seen...that was completely awesome. I think you covered it pretty well. Broadcasters-annoying (more on that below). Beckham-yummy...I mean, good...no, yummy works. The thing that got me was the children signing/singing God save the Queen. I'm pretty sure I saw a tear in her eye at one point. The rest of the royals were way too stiff. Someone should spike their drink before the closing ceremonies. I loved how they focused on all of the areas GB has had an affect...technology, literature, movies, tv...but I expected more focus on the diversity in culture that makes up GB...loved the Scottish chick playing the drums though. All in all, they did a good job (and I'm super glad they replayed it because we missed the first 45 minutes with the original broadcast). Btw, we had different broadcasters announcing it. Meredith Vierra would have made me go insane. It was some NBC sports caster who I actually enjoyed when Matt Lauer let him speak but Lauer, yeah, super annoying and very excited about the NHS. Have to agree on the announcers. I mean who in gracious name thinks that they have the right to speak OVER Paul McCartney? Lord Have Mercy! I LOVED the bike scene with the wings, I thought that was awesome. I loved it, thought that it was fantastic! Totally didn't watch the opening ceremonies, so this post is nice :) We don't have cable, so we don't plan on watching anything. Not that we have time, anyway! I didn't get to watch the opening ceremonies (now I am just trying to stream what I can, although that isn't working so great). I really enjoyed your post and and now I really want to make sure I watch it at the next Olympics! 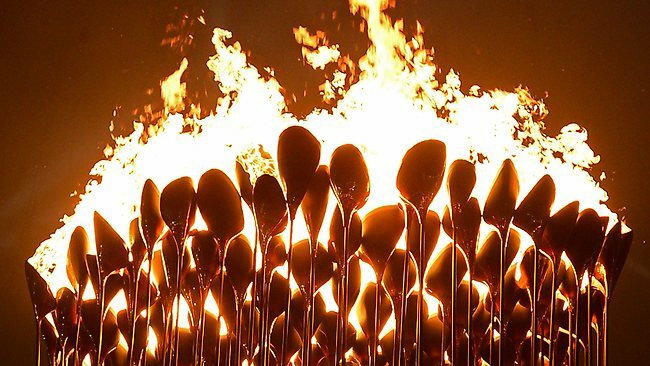 I am absolutely obsessed with the Olympics. I will probably do a blog about it on Monday. But I enjoyed yours so much that I am not sure I want to now. Lol. I think Beijing is the best opening ceremonies I have ever seen. But in all fairness they have more money, and a nation forced to volunteer their time. Besides the overall feeling of the world coming together and the mushy gushiness I always feel when the Olympics starts, I got to say the the Queen's Corgis were my favorite part. Haha. Love Corgis! Thank you for posting this! I was disappointed that I was unable to watch it, so it's nice to see a great recap! One of the girls I volunteered with in Ofunato last year was one of the dancers in the ceremony...I'm going to pretend she's one of the cool rock dancers in the photo you posted above! Dude, what's up with Great Britain's gold armpits? To hide the sweat? Huh? Thanks for posting the pics. We watched, but didn't make it through the parade of nations or whatever it's called. I was falling asleep. Are you sure it was Costas annoying you? It was Matt Lauer and Meredith doing the entire opening besides the athletes walking out. When they came out, he took over.